Participants who attended the mid-term stakeholder workshop organized by REFORM (Brussels; February 2013) were generally content with the scope and focus of the REFORM project (see relevant article in our 3rd newsletter). There were, however, requests to specifically address several additional topics. Out of these, two targeted additional activities were selected: i) the importance of groundwater for river-floodplain ecosystems and ii) the environmental flow assessment in Mediterranean rivers. The activity on groundwater is addressed in this newsletter item. 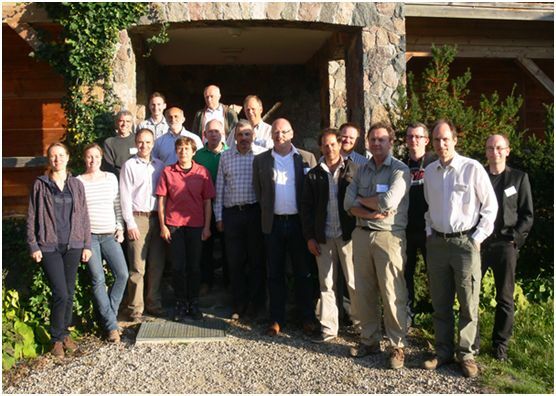 A group of 18 experts from Denmark, England, Germany, The Netherlands, Poland, Scotland, Spain and Sweden met in Kuwasy (Biebrza Valley, Poland) on 15 – 17 September 2014 to discuss the relevance of groundwater-surface water interactions in European actions oriented at sustainable water management. The workshop was organized by the Warsaw University of Life Sciences – SGGW and Deltares. The aim of the workshop was to critically review the European level of consideration of groundwater-surface water interactions in the practice of water management and environmental policy implementation. The workshop activities (keynote lectures, discussions, field trips) were aimed to put together the experience of the 18 international specialists from the different fields related to the research and management of aquatic and wetland ecosystems. In the opening speech of the workshop, Prof. Tomasz Okruszko from the WULS-SGGW (Poland) highlighted the goals of the workshop and presented the hydrological features of the Biebrza Valley – a hotspot of groundwater-surface water interactions and its influences to ecosystems and management issues. In the morning session of 16 September, invited speakers (Dr. Hans Jorgen Henriksen, Dr. Hans-Peter Broers, Dr. Jörg Lewandowski, Dr. Johan Schutten, Dr. Rafael Sanchez Navarro and Dr. Gareth Old) presented the issues and examples of various contexts of groundwater-surface water interactions, including water quality and quantity, e-flows, land use and biogeochemistry. The afternoon field trips to the area of the river Jegrznia restoration project and to the wetlands of Grzedy and Czerwone Bagno (both located in the Biebrza National Park) allowed participants to get some insights into the practice of groundwater-surface water interactions management in protected wetland areas. For the evening discussions participants were divided into sub-groups on the topics related to the research and knowledge gaps, practical approaches to groundwater-surface water interactions and science-policy interrelations. Groundwater is underrepresented in the policies related to the management and restoration of aquatic and wetland ecosystems. Not accounting for groundwater-surface water interactions will not allow the successful implementation of the Water Framework Directive and the Habitats Directive. Not only the environmental conservation policies should emphasize the importance of groundwater-surface water interactions, but this should also be clearly reflected in the Common Agricultural Policy implementation. The relevance of groundwater to the resilience of aquatic ecosystems should be revisited. However, there is a need for appropriate indicators to be developed and applied in order to quantify the groundwater-surface water interactions for the management and restoration of these ecosystems. Finally, participants agreed that current legal regulations (WFD and Natura 2000) do not require much improvement in terms of reflecting the needs of groundwater-surface water interactions. What is missing is the appropriate implementation of environmental policies regarding the conservation of groundwater and surface waters as inherent and joint elements of a high-quality environment. The main outcome of the workshop is a policy discussion paper oriented at the issues highlighted at the workshop on groundwater-surface water interactions in European policy. The policy paper will be available on the REFORM website in February 2015.